"This is a satisfyingly hearty sauce that you can feel good about eating! Serve over whole grain spaghetti or brown rice pasta for gluten-free diets." Heat a large skillet over medium-high heat. 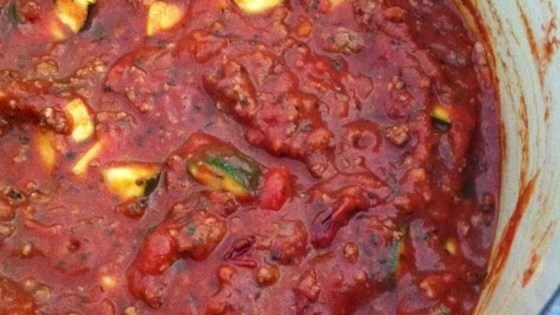 Cook and stir ground beef, zucchini, onion, and garlic in the hot skillet until beef is browned and crumbly, 5 to 7 minutes; drain and discard grease. Stir crushed tomatoes, tomato sauce, sucanat, basil, sea salt, oregano, and black pepper into beef mixture. Bring to a boil, reduce heat to low, and simmer until flavors have blended, at least 30 minutes or up to 1 hour for better flavor. While sauce is simmering, bring salted water to a boil and cook spaghetti according to package directions. Serve sauce over hot pasta. See how to make Chef Johnson’s homemade noodles and rich Bolognese sauce. Use any lean ground meat: ground beef, bison, or turkey. This was hugely satisfying over spaghetti squash. I subbed 1/2 T of honey for the called-for sucanat. This is a wonderful recipe. I plan to use it at our next soup kitchen meal. This is especially great if you use tomatoes imported from Italy! Very good! Left out the meat (vegetarian daughter), and used gluten free pasta. Excellent. I used 1lb turkey sausage, simmered for about an hour, and added mushrooms halfway through. Turned out great!